Apache Hadoop 3.1 have noticeable improvements any many bug fixes over the previous stable 3.0 releases. This version has many improvements in HDFS and MapReduce. 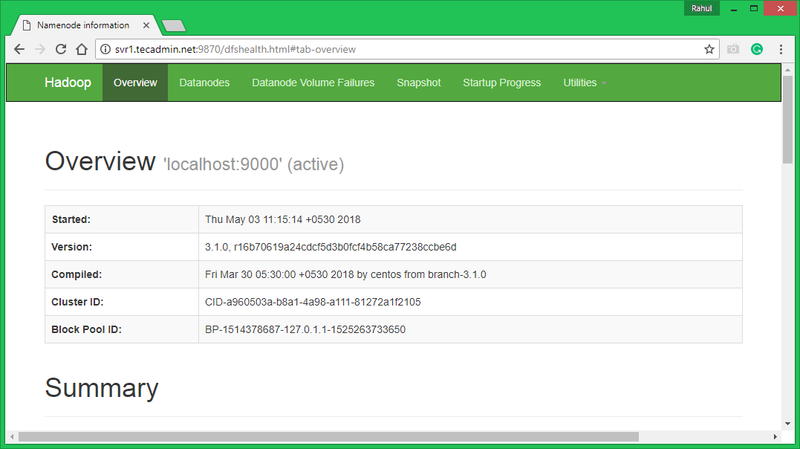 This tutorial will help you to install and configure Hadoop 3.1.2 Single-Node Cluster on Ubuntu 18.04, 16.04 LTS and LinuxMint Systems. This article has been tested with Ubuntu 18.04 LTS. Java is the primary requirement for running Hadoop on any system, So make sure you have Java installed on your system using the following command. If you don’t have Java installed on your system, use one of the following links to install it first. We recommend creating a normal (nor root) account for Hadoop working. To create an account using the following command. After creating the account, it also required to set up key-based ssh to its own account. To do this use execute following commands. Now, SSH to localhost with Hadoop user. This should not ask for the password but the first time it will prompt for adding RSA to the list of known hosts. In this step, download hadoop 3.1 source archive file using below command. You can also select alternate download mirror for increasing download speed. Setup the environment variables used by the Hadoop. Edit ~/.bashrc file and append following values at end of file. Now edit $HADOOP_HOME/etc/hadoop/hadoop-env.sh file and set JAVA_HOME environment variable. Change the JAVA path as per install on your system. This path may vary as per your operating system version and installation source. So make sure you are using the correct path. WARNING: /home/hadoop/hadoop/logs does not exist. Creating. 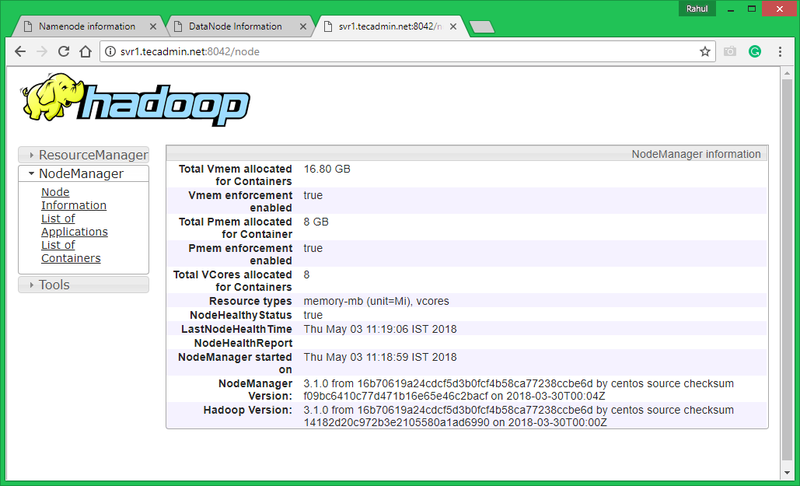 2018-05-02 17:52:13,717 INFO common.Storage: Storage directory /home/hadoop/hadoopdata/hdfs/namenode has been successfully formatted. 2018-05-02 17:52:14,161 INFO namenode.FSImageFormatProtobuf: Image file /home/hadoop/hadoopdata/hdfs/namenode/current/fsimage.ckpt_0000000000000000000 of size 391 bytes saved in 0 seconds . Let’s start your Hadoop cluster using the scripts provides by Hadoop. 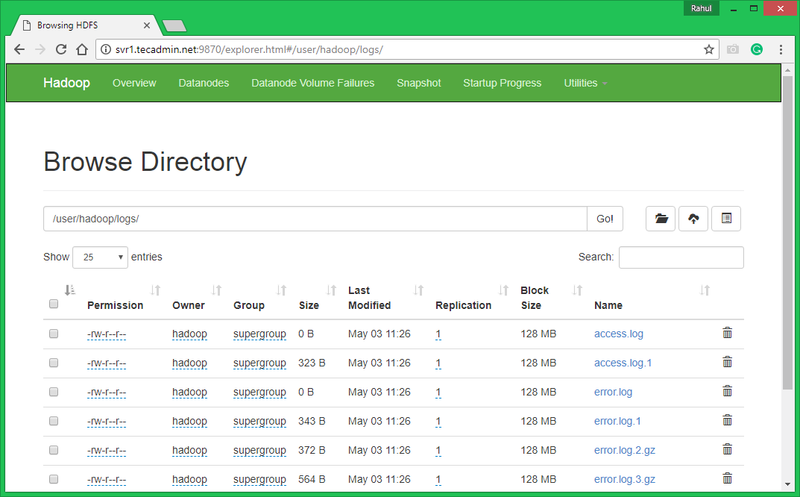 Just navigate to your $HADOOP_HOME/sbin directory and execute scripts one by one. Hadoop NameNode started on default port 9870. Access your server on port 9870 in your favorite web browser. 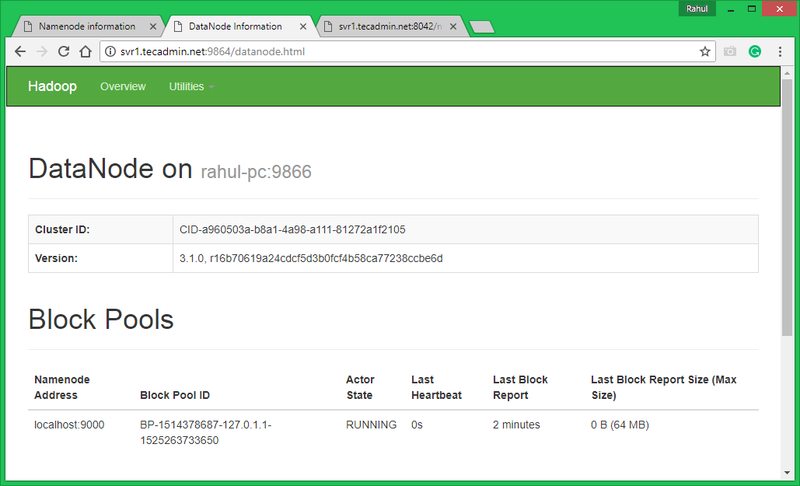 Access port 9864 to get details about your Hadoop node. 7.1. Make the HDFS directories required using following commands. 7.3. Browse Hadoop distributed file system by opening below URL in the browser. You will see an apache2 folder in the list. Click on the folder name to open and you will find all log files there. You can also check this tutorial to run wordcount mapreduce job example using command line.